Sensational and rip-roaring with lots of nonstop speed. Unstoppable is one of those certified “breathless” action movies because it truly is nonstop. A movie buff like me, after awhile, gets tired of men-with-guns action movies. This one is a man versus machine action movie that is grounded in reality. 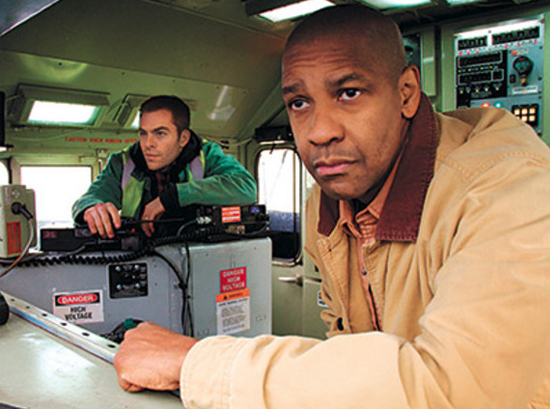 Denzel Washington (“Book of Eli”) and Chris Pine (“Bottle Shock”) are the ordinary men on a mission to stop a runaway train before it crosses an elevated S- curve in Stanton, Pennsylvania that will undoubtedly tip over the 39-car train carrying highly flammable toxic material that could doom the town’s population of over 700,000. The constant variation in backdrops while the trains are in motion adds graphic texture to the film. Disaster and wreckage fans will dig it most. Ill-tempered audiences will simmer about Denzel’s character having two airhead-y tart daughters working at Hooters especially in how they root and cheer their dad on while observing television news footage instead of being stifled with worry. Discerning movie fans will find that some particular exposition is genre cheeseball, but if you can laugh at it all and still get psyched over the next wave of juggernaut excitement, the results can be hella fun. Frank Barnes (Washington) is the veteran engineer with nearly three decades of experience under his belt, and Will Colson (Pine) is the new conductor who through nepotism was able to slide his way into the job. Friction occurs between man of experience and man of inexperience, each of them undergoing negligible family problems at home. If you are a hot-blooded male, you will prefer when the movie cuts to Barnes’ nubile daughters more than to cuts of Colson’s unhappy tight-faced wife. Not wasting too much time, the predicament begins when a sloppy and careless engineer hops off to flip the track switch thinking that he pulled the breaks on the train. As the train gets away, a report that a “coaster” in on the loose meaning that it is heading off at slow enough speed to catch it up ahead. Attractive yard master Connie Hooper (Rosario Dawson) puts out a quick alert and assigns yard man Ned (Lew Temple), a coffee caffeine and ponytail guy, to get this thing stopped. They both learn soon enough that they got a train on full throttle. Connie sticks to the control room dispatching quick orders and Ned spends the running time racing his truck alongside the train. Corporate executive and dunderhead Galvin (Kevin Dunn, good as a white collar dunce) does not want to derail the train, which would be bring things to an immediate close if done early enough, because he is concerned about financial losses of a destroyed train. The alternative ways of commandeering, blockading and hindering the full throttle locomotive lends plenty of danger. Quick solutions are needed to stop the train before it collides head-on with a commuter train full of school children and other prospective casualties. As the worst of disasters becomes imminent, it seems that Barnes and Colson become the last line of defense, their proposed actions meeting the approval of attractive Connie but not the soulless Galvin who is more invested in the outcome of the company’s stock holdings. Barnes and Colson run their train backwards so they can latch on and bring the runaway to a stop by mean of tug of war. 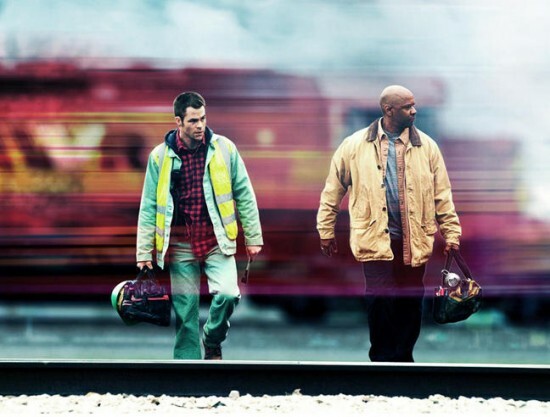 For those ambivalent about director Tony Scott (“Man on Fire,” “The Taking of Pelham 1 2 3”) and his fixation with noise and excess, I’ll say to you that this is the best film he’s ever made and probably the best one he will ever make. This time avoiding overkill, Scott lends the torrent of images a suitable velocity without over editing or over cranking his cameras. Heaps of action is captured by a helicopter news camera that provides us with cohesive overhead images. But the mechanics of the story are there, too. We give a damn, in terms of smart engineering dynamics, in just how these guys are going to prevent disaster before time runs out. I friggin’ love runaway train movies. There must be at least five of them: “The General” (1926), “Silver Streak” (1976), Runaway Train (1985), “Under Siege 2: Dark Territory” (1995) and now this bad boy. Film Cousins: “The General” (1926); “Silver Streak” (1976); “Runaway Train” (1985); “Under Siege 2: Dark Territory” 1995).